So, instead of cooking fancy campfire meals, I've gone a little crazy with cleaning out closets and reorganizing! I'm not kidding. No one warned me about the boredom that would come without all these rooms. So, with too much time on pinterest, searching the web for decorating ideas for this new kitchen, I've gotten the "re-do everything" bug. 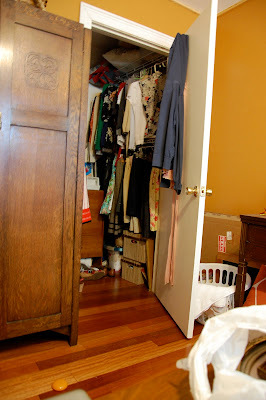 This week, it started with my closet/sewing storage area. And there's more to come, believe me. With a few bumps in the road with the kitchen project (like plumbing issues that have to be taken care of, waiting for certain experts to come to take care of their jobs, etc), the rest of my house better be lookin' good by the time this kitchen is finished. the right side of my bedroom closet. before. 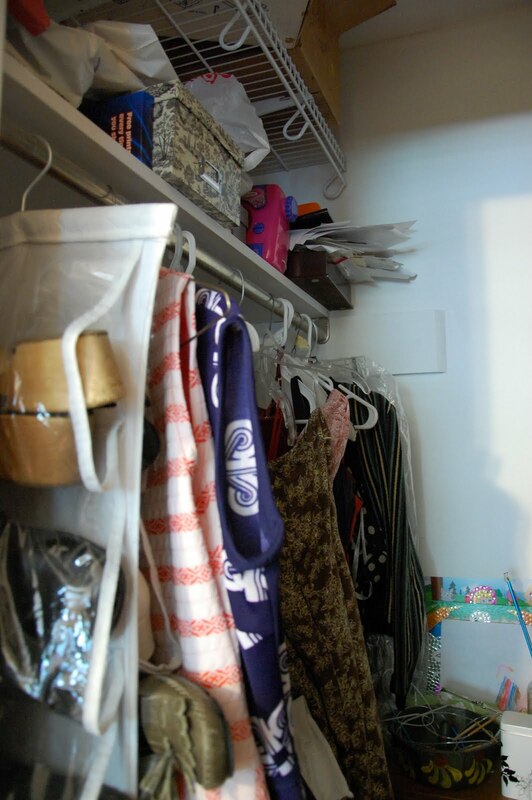 the left side of closet. before. For your waiting enjoyment, I'll save the "after" for next time...just to create a little suspense in your life. No fair... I prefer the before followed by the after... and you are much better than me, I sometimes don't realize I am getting into an organizing project until it is half ripped out and I never take the before picture! Don't forget "stir crazy momma", you are welcome here anytime! And I do mean, any time. With or without warning! hint...leave the closet doors open when you're all finished. Okay heather...let's see, how do I get it all done? ummm. this would be a good idea for a post. let's just say, with lots of unsupervised children running around the house.